The Tax Foundation and Cato have just released their rankings of state tax environments and governors. Here's the breakdown. One (hopefully endearing) trait of being a policy wonk is that I have a weakness for jurisdictional rankings. At least if they’re methodologically sound. This is why I was so happy a couple of weeks ago when I got to peruse and analyze the 2016 version of Economic Freedom of the World (even if the results for America were rather depressing). Heck, sometimes I even can’t resist commenting on methodologically unsound rankings, such as the profoundly stupid “Happy Planet Index” that puts despotic hellholes such as Cuba and Venezuela above the United States. Kudos to Florida and Indiana with an honorable mention for North Carolina. Given my interest in rankings, you can appreciate how excited I am that my colleague at Cato, Chris Edwards, just unveiled the 2016 version of his Fiscal Policy Report Card on America’s Governors and that the Tax Foundation just released its annual State Business Tax Climate Index. It’s sort of like Christmastime for me. Here’s the big news from Chris’ Report Card. As a Virginia resident, I’m not terribly happy that Governor McAuliffe scores a D (not that his GOP predecessor was any good). It’s also perhaps somewhat newsworthy that Governor Pence earned an A (so he seems committed to smaller government even if the guy he’s paired with doesn’t share the same philosophy). And here’s the Tax Foundation’s map showing each state’s ranking, with top-10 states in blue and bottom-10 states in light orange. If you pay close attention, you’ll notice that zero-income-tax states are disproportionately represented among the states with the best scores. All this is quite interesting (at least to me), but it occurred to me that it might be even more illuminating to somehow meld these two rankings together. After all, Chris’s Report Card is a measure of whether a state is moving in the right direction or wrong direction while the Tax Foundation is more of a comparative measure of how a state ranks at a given point in time compared to other states. Unfortunately, there aren’t any bad states moving aggressively in the right direction. So I created the following matrix that looks only at the states that received A or F in the Cato Report Card and also were either in the top 10 or bottom 10 of the Tax Foundation Index. As you might guess, the best place to be is in the top-left portion of the matrix since that shows a state that is both moving in the right direction while also having a very competitive tax system. 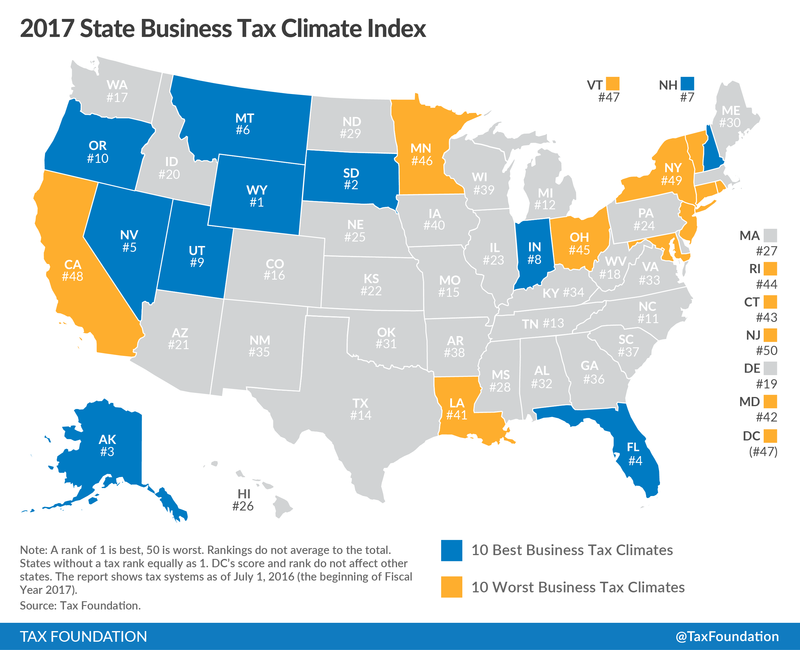 So kudos to Florida and Indiana (with honorable mention for North Carolina, which received an A in the Cato Report Card but just missed cracking the top 10 in the Tax Foundation Index). The bad news, if you look at the bottom-left quadrant, is that there are three states with good tax systems but bad governors. South Dakota, Oregon, and Nevada are in strong shape today, but it’s hard to be optimistic about those states preserving their lofty rankings since policy is moving in the wrong direction. And the worst place to be is the bottom-right quadrant, which means that a state has both a bad tax system and a bad policy environment. Last but not least, the sad news is that the top-right quadrant is empty, which means there aren’t any bad states moving aggressively in the right direction. So the bottom line is that American citizens should think about moving to Florida and Indiana. Especially if they live in Vermont, California, or Connecticut. P.S. It would be even better to move to Monaco, Hong Kong, or the Cayman Islands, but those presumably aren’t very practical options for most of us. P.P.S. Actually, the best place for an American taxpayer to live is Puerto Rico since it’s a legal tax haven.